Just because you messed up, it doesn’t mean you have to end up serving your time. Our three-hundred-sixty degree approach means that we can match you with an appropriate treatment provider or alternative sentence. The most common cause of criminal convictions is addiction. The sad reality of addiction is that it is difficult to overcome and users frequently relapse. Expecting someone with a heavy habit to pass every drug test is unrealistic. If you or a loved one have a setback while you are on probation, we can help. 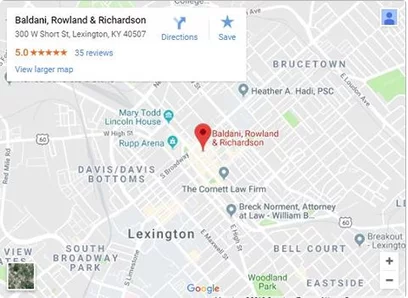 Contact our Lexington criminal defense attorneys at Baldani Law Group PLLC to figure out what to do next. We can listen to the facts and help you decide what is best for you. Call us now at (859) 259-0727 or contact us online to schedule an appointment for your consultation. Other violations of similar magnitude. Misdemeanor conviction that does not require submission to the releasing authority. Violations of an assaultive nature. If you are facing a probation revocation in Lexington or anywhere in Central Kentucky, give our firm a call today. We’ve handled dozens of probation revocations and have been successful in getting people released early on shock probation. Call Baldani Law Group today at (859) 259-0727 , or contact us online.